HBO has confirmed the debut date for 2018 Rock and Roll Hall of Fame Induction Ceremony, with the special scheduled to debut Saturday, May 5th at 8 pm ET/PT, exclusively on HBO. 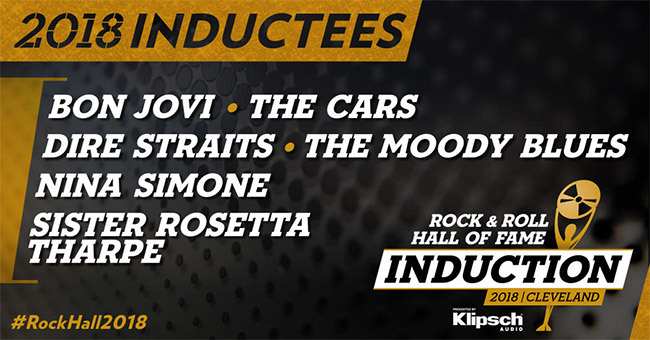 This year’s inductees include Bon Jovi, The Cars, Dire Straits, The Moody Blues, Nina Simone and Sister Rosetta Tharpe. Confirmed special guests and presenters include Mary J. Blige presenting for Nina Simone, Andra Day performing for Nina Simone, Brittany Howard presenting for Sister Rosetta Tharpe, Ann Wilson presenting for The Moody Blues, Brandon Flowers presenting for The Cars, Howard Stern presenting for Bon Jovi and Steven Van Zandt as special guest. The 33rd annual induction ceremony is set to take place on April 14th and will be broadcast on SiriusXM as well as HBO.